This was our fourth year, and each time it gets a little easier to run the event, but we keep adding new things each time making things more complicated. This year the theme of the convention was “Brick Technologies” in honor of Silicon Valley where it is held, and we added a lot of technology around running the convention, especially on the website. For example, for the first time, instead of having attendees edit a wiki page, we had a database where people could list the MOCs (“My Own Creations,” our term for custom made models) they are bringing to display. As the only experienced Perl developer on the organizing team, it fell to me to make all these changes, and over the past few months I’d been spending all my spare time working on the registration system for people to sign up their badges, vendor spaces, MOCs, etc. One piece of technology that never did get finished was a custom iPad app for judging. We had a volunteer, Julian Gomez of Polished Pixels, working hard on an app for us to use. The judges would use iPads to select the models they wanted to vote for and upload their votes and take pictures of the models using this custom app, and we also planned to use the app to scan people’s badges as they enter the evening ceremonies so we wouldn’t call any names of people who weren’t actually present. However, due to some technical issues that came up and issues with Apple’s developer license program (and through no fault of Julian’s), the app wasn’t available. Julian’s work is much appreciated however, and we look forward to having it available for next year. I arrived at the hotel Thursday afternoon and checked in, and we were able to get in to the ballroom in the early afternoon to measure out the placement of all the tables for hotel staff to set up. I spent most of the afternoon writing code, personally, getting the MOC Card system ready to print out the cards. MOC Cards are the little signs that everyone places by their models to identify the name, description, and builder of each model. Each card has a QR code on it, which goes to a webpage describing the model (and which the iPad app was supposed to use to identify the MOC for voting). I wrote custom Perl code using the PDF::API2 library to generate the cards, and sent the results out to Kinko’s FedEx Office for overnight printing. (We also had a color printer and paper cutter onsite for printing additional cards after the initial batch.) I went to bed around midnight, having told FedEx to email me when it was ready. I had sent out a call for a volunteer to run over to pick up the printouts in the morning, but at 3am I got up to use the bathroom and checked my email, and they said that our job was done. I decided rather than have someone slog through rush hour traffic in the morning, I’d just go in the middle of the night. I drove off to Cupertino to pick it up, and had a hard time finding the place, but eventually I did and brought it back to the hotel, leaving it in our office for the other organizers to pick up in the morning. My plan was to sleep in, but I woke up early anyway so I went ahead and went downstairs having had about 3 hours total sleep. Friday morning I was a bit of a zombie, but we got all the rest of the setup done and in the afternoon I was able to attend some of the sessions. I ran the 101 Bricks game, which is always a lot of fun. We had some very creative models built, with an eventual winner with the theme “RAINY” going to Donna’s “SNOT Cloud” model. After that, I went to Zonker Harris‘s talk on lighting LEGO models using EL Wire and LEDs. I really like what he’s done with those technologies for his movie theater (EL wire to simulate neon lights) and disco dance floor (flashing lights underneath a translucent LEGO floor). There were a few other light-up models at the convention, and hopefully that trend will continue. BrickCon in Seattle has a section called “The Darker Side” where models are displayed in a tented area so the room lights don’t overwhelm the models’ internal lighting, and BrickWorld goes a bit farther having an hour with the hall lights off so everyone can go around and see the light-up models in the semi-dark. Maybe if we get more light-up models we can do something along those lines at BBTB in the future? After Zonker’s talk I went back down to the ballroom, and spent the afternoon working on administrative stuff and more software for the event website. We had a few walk-ups, mostly people who had registered their child but not themselves or vice-versa. Our policy is to close registration a week before the event, but in the future we need to be better prepared for these situations, as they required a fair amount of manual work to process. After the keynote, I handed out the Scrounge Build packets, then went out to the lobby to run the Wacky Racers and Catapult contests, which are always a lot of fun. Saturday, I missed most of the activities as I ended up spending a lot of time finishing up some of the things we would need for the website to make the convention run as planned. For example I spent all Saturday afternoon hacking on the voting system so that the judges would be able to submit their votes and pictures of the winners, and generating the PDF for the award ceremony. I just barely got that code finished in time for the ceremony itself; in fact for the first 1/2 of the ceremony I was sitting off to one side in the theater frantically coding the software to generate the slides, while my faithful minions ran around the ballroom taking and uploading pictures of all the models that hadn’t been photographed yet. But eventually they got all the photos uploaded just as I finished work on the code to generate the slides. But then I ran into an unexpected snag: the PDF is 14 megabytes, and it took quite a long time (I didn’t time it, but I think it was about 20 minutes) to download on the slow wifi. So we had to stall a little bit while that downloaded, but eventually it was done and we managed to get it up on the screen to give out the awards. There were two minor issues – photos showing up rotated (my code was ignoring the EXIF Orientation flag, oops) and Overall trophies showing up in the theme trophy sections (it was showing the winners in the theme they were registered under instead of the theme of the trophies). It was funny watching hundreds of people tilt their heads sideways to look at the pictures! As for the trophies showing up at the wrong times, once I figured out what was happening I skipped over those and announced they would be given out Sunday night. Saturday night we had something new at BBTB: a no-host bar, called “Brick Saloon.” This was an opportunity for the adult attendees to hang out, play some games (I brought Cards against Humanity, and someone brought some LEGO bricks to play a version of Zendo with instead of the more customary Icehouse pyramids). I don’t drink, so the bar wasn’t my cup of tea (DID YOU SEE WHAT I DID THERE?) but I hung out and played games a bit. I went downstairs to the ballroom after a while to take photos of MOCs until my camera battery died, and then went back up for more games until it was time to close at 2am. 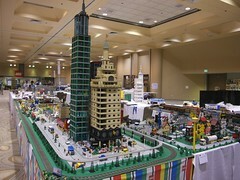 Sunday is the big public show at Bricks by the Bay. Unlike most conventions we just have one public day. the vendors complain every year, but it’s a lot less stressful this way, and we always make enough money to make our budget (Bricks by the Bay is a non-profit) so it’s not necessary to have two days. I have delegated all the public day operations to other people, so I was able to sleep in and get there around 10am just as people were going in to the show. I hung out at the admin desk for a while, answering questions and such, and then in the afternoon went upstairs for the Large Set Parts Draft. Parts drafts are one of my favorite convention activities, and I had to miss the one on Saturday as I had too much work to do (I sent Bruce to draft in my place, and he got some great parts, but I really would rather have been there myself). Almost any LEGO part is useful if you have enough of them, and a parts draft lets you take all of the parts of a particular shape and color from as many as a couple of dozen copies of the same set. The trade-off is that everyone else participating gets to do this too, so you only end up with a few unique pieces, but many of them. We did some trading (e.g., “I’ll give you 8 of these for 4 of those”) after the parts draft for some parts that each of us wanted but other people got. After the parts draft I went back down to the ballroom, and finally at 4pm we closed up and kicked all the public out. We had a brief closing ceremony where we announced the overall MOC winners and the results of the games that had happened after the Saturday ceremony, and I had a brief Q&A about the next year’s convention. Finally we tore down all the stuff and everyone went home. I spent the night in the hotel again Sunday night, and Monday morning got together with Bruce and Loren, the other Directors, to tie up loose ends and take all the stuff back to the storage unit. We had lunch from a taqueria and got all the boxes stowed, the storage locked, and we each went home. I took the rest of the day off work, and went back to work Tuesday (working from home all week). It took a few days for me to catch up on my sleep, and I still had a little bit of coding to finish up, but it’s time to put things away for another year. Come join us next year!! We’re adding 50% more ballroom space, and a full day of workshops on Thursday before the usual convention activities start. See all my pictures of MOCs from Bricks by the Bay 2013 by clicking the image above, or click here for a slideshow.